Wazobiawap Is The Best Online Portal For Latest News, Music, Video, Information, Education, Technology, sport, Betting guide, Tips and so on. Something great and magnificent seems to be happening this year 2019, among all telcos, MTN is the first to be giving out whooping 4GB of data to their loyal subscribers just for free. I don’t know if this is for everybody but definitely it is the new year gift. 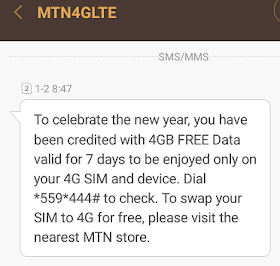 "to celebrate the new year, you have been credited with 4GB Free Data Valid for 7 days to be enjoyed only on 4G enabled devices"
Dial *559*444# to check your free 4GB data. Did you also receive yours? How I wish other networks will do the same. Please Share this Article with your Friends on Facebook, Twitter, and Google+. Are you Finding it Difficult to Comment? See How to Comment on Wazobiawap.